In the 1990’s Corgi began making Postman Pat toys. These were basically updated and slightly revised versions of the 1980’s ERTL die-cast figures and toys. 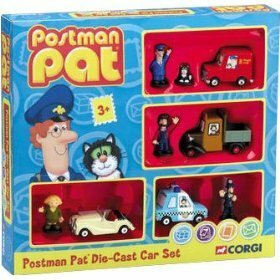 The Corgi range featured Postman Pat, Jess and Van; Ted Glen and Truck; Dr Sylvia Gilbertson and Sports Car; PC Arthur Selby and Police Car; and, Ajay Bains and Greendale Rocket. An additional set included two extra carriages for the Greendale Rocket that connected with magnets. Corgi also released larger boxed sets. 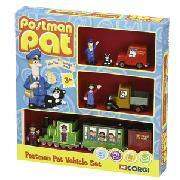 The Corgi Postman Pat Die-Cast Vehicle Set contained Pat 1, Ted’s Truck and the Greendale Rocket in one boxed set. The vehicles connected together with magnets at the back. They could be used on a connectable wooden track. 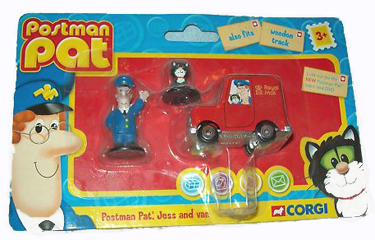 The Corgi Postman Pat Die-Cast Car Set contained Pat 1, Ted’s Truck, PC Selby’s Police Car, and, Dr Gilbertson’s Sports Car. 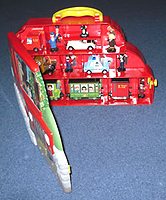 As well as the blister packs and boxed sets, Corgi released a Postman Pat Carry Case into which all the vehicles and figures could fit. 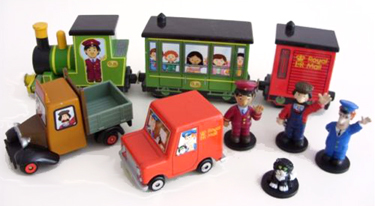 Corgi Postman Pat figures were made of solid plastic on fixed bases with no articulation. The Corgi Pat figures, standing around 1″ high are much smaller than the Born to Play 4″ articulated figures and the 2.75″ Character Options figures.